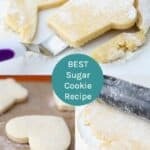 This is the BEST Cut Out Sugar Cookie Recipe! 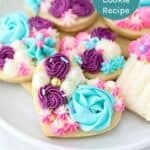 The soft-baked sugar cookies are not overly sweet and they are perfect with vanilla buttercream. This is such an easy cut out cookie, it only requires 15 minutes in the freezer and comes out perfect every time! This is the sugar cookie recipe I grew up on. Every Christmas we made these or any other occasion that called for sugar cookies. It is one of the traditions I still look forward to the most and if you ask my childhood friends, this is THE cookie everyone wanted at Christmas time. My idea of the Best Sugar Cookie Recipe is thick & soft with a pillowy texture. It’s not overly sweet at all, that’s what the frosting is for. It’s a basic and easy sugar cookie that only needs about 30 minutes of chill time. What could be better than that? 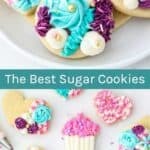 It’s also a great recipe because you can make the dough ahead of time and freeze it, or better yet, you can make the cookies ahead and freeze them before frosting! This can be a huge time saver if you’re doing your holiday baking. If you don’t know how to make sugar cookies, don’t worry, I am here to help! A half batch of sugar cookie dough makes about 24 medium sizes cookies depending on your cookie cutter. However, the recipe has easily be doubled for large batch baking. Just be prepared for alllll the decorating that comes with a double batch. 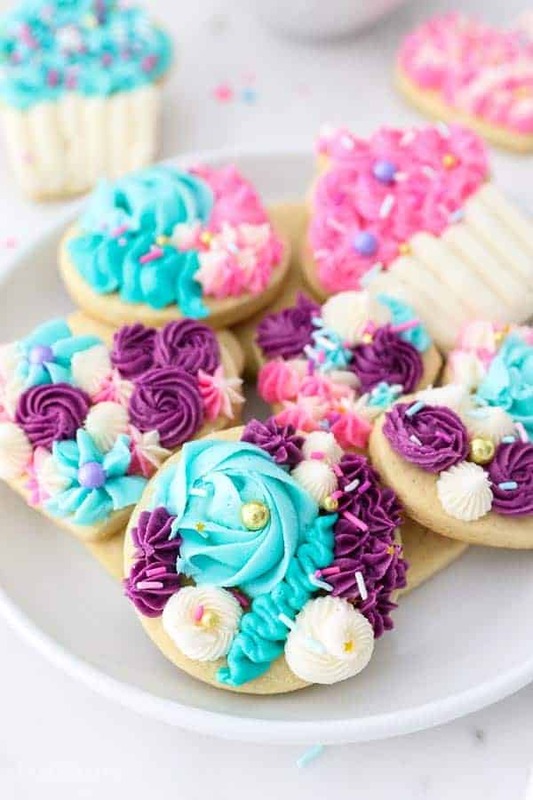 I am also a firm believer in sugar cookies that are decorated with buttercream. I’ve tried my hand at royal icing, but it just isn’t my favorite. 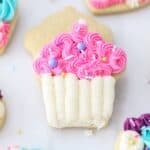 I love the contrast of a sweet American buttercream on a fluffy sugar cookie. These literally, (yes, I said it! ), melt away in your mouth. If you feel intimidated by making buttercream at home, I am here to tell you that I can help! It’s all about the butter. My recipe for my Perfect Vanilla Buttercream starts with cold butter, which is whipped at the various stages to produce a light and fluffy buttercream that is perfectly stable for piping. 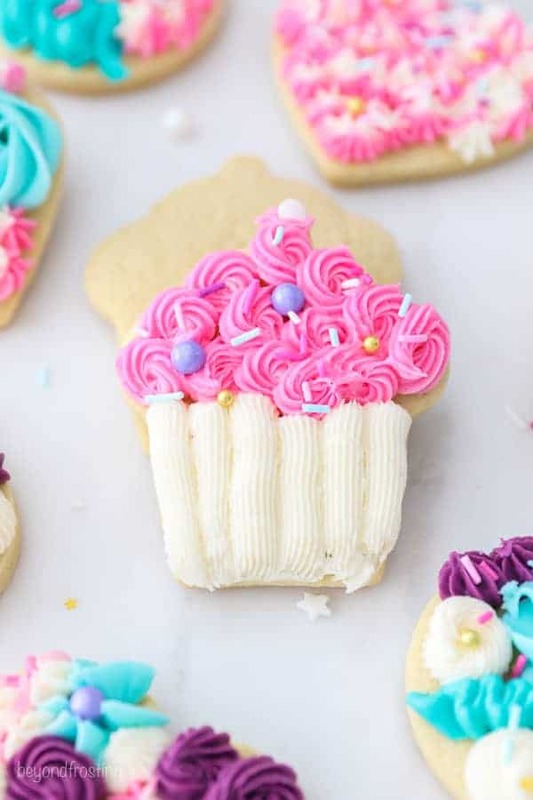 You’ll also want to be sure to check out my post about how to make buttercream which is full of tips and tricks so you can be successful whether you’re making sugar cookies, cakes or cupcakes. I used to not love the decorating part as much as I do now. Slowly but surely, my decorating skills are improving. I am not a cookie decorator by any means, and I like to keep it real easy when it comes to decorating. That’s why you’ll see a lot of cookies decorated with open star tips! 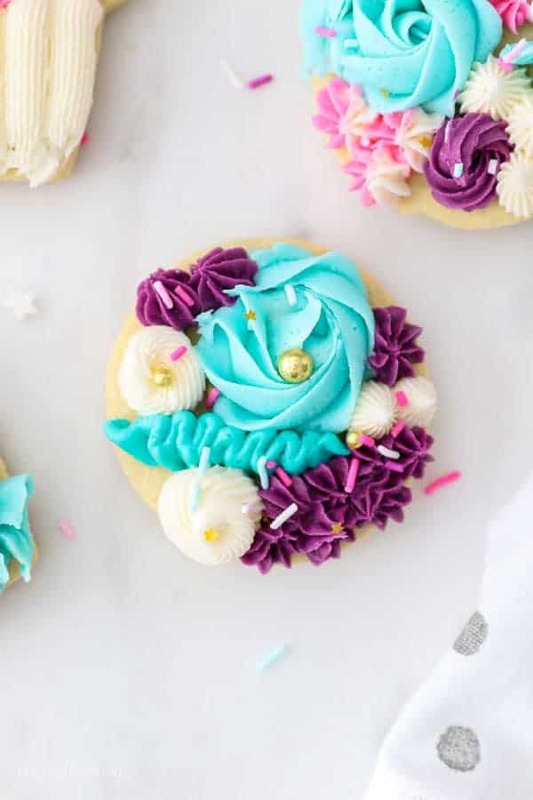 Several years ago I’ve also shared all my tips for decorating sugar cookies with buttercream, which can be a very helpful post if you’re new to decorating cookies. It covers the basics, like how to properly color your frosting. Lately I’ve been finding myself so inspired by the creative cookie and cake decorators I’ve follow on Instagram (Jenny Cookies, Cremedelacombe, Brittany May Cakes) So, I thought that I’d try my hand at decorating these sugar cookies in a more non-traditional way. These would be the perfect addition to a baby shower, a brunch or really any party for that matter. They’re elegant and fun, colorful and playful. And guess what? My color palette all started with a sprinkle mix! 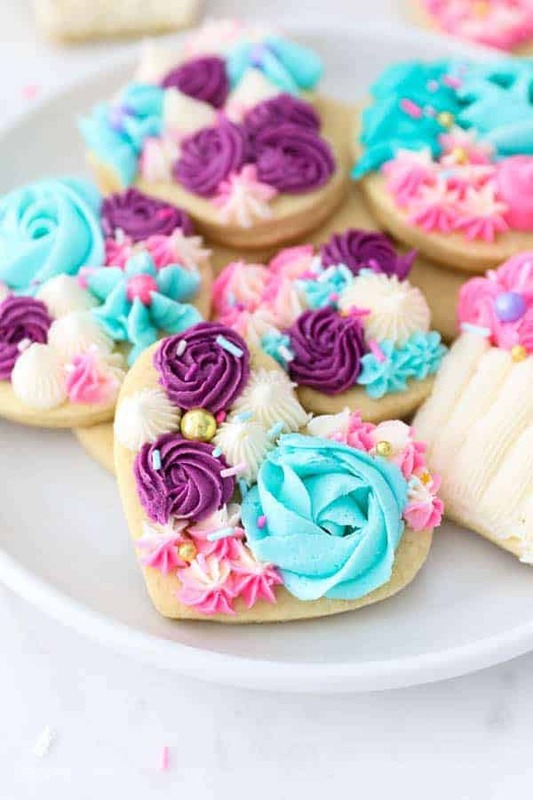 Whenever you’re decorating sugar cookies, be sure to save some white frosting to help break up the darker, more contrasting color. I also like to mix shades of pastel with dark hues. This time I even made a marbled buttercream with a little bit of pink and white. First cream together the butter and sugar. You want to start with butter than is slightly softened, about 20-30 minutes. If you’re in a pinch, throw it in the microwave for 10 seconds. Next, add the liquid ingredients. This recipe calls for baking soda to be dissolved in milk. It’s nothing fancy, just stir it in and add it together with the eggs and vanilla extract. Finally, add the dry ingredients. It’s just flour and a pinch of salt. Chill the dough. You can’t skip this step. Chilled dough makes it MUCH easier for you to roll it out the dough and also helps them from spreading while they’re baking. However, this dough does not require a very long chill time. Roll out the dough. 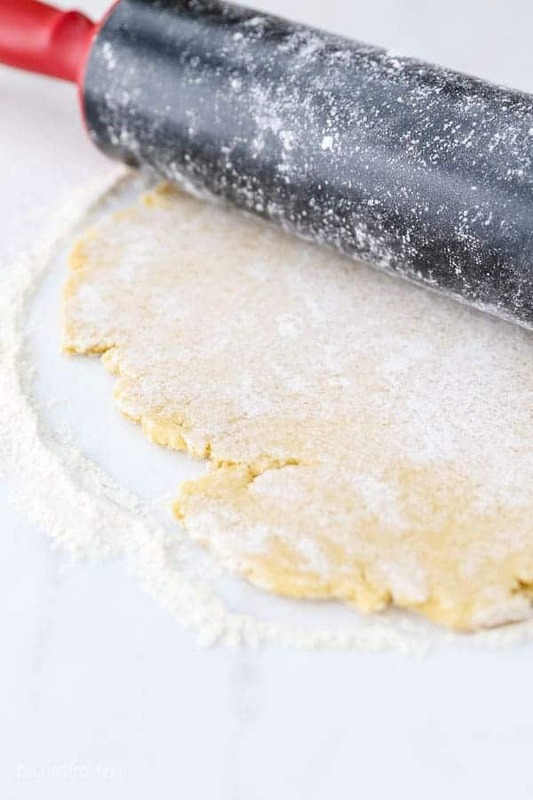 Be sure to use a well-floured surface, and roll your dough at least 1/4 inch thick. Brush away any excess flour with a pastry brush. Bake your cookies. I like to keep my pans rotating through the oven, so by the time one comes out, another goes in. I also only bake one tray at a time because I don’t want them to bake unevenly on a top or bottom rack. One tray at a time, baked in the middle of your oven. Time to decorate! Have fun, be creative and don’t be too hard on yourself. 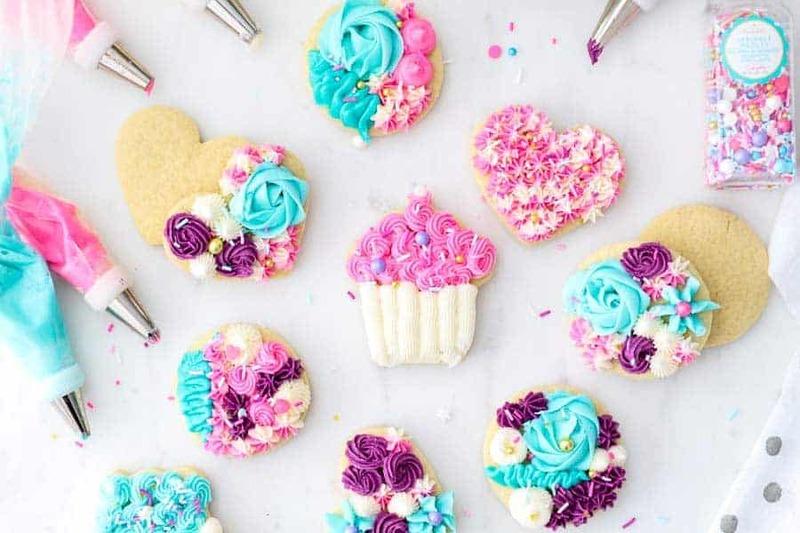 A variety of piping tips is definitely your friend. Start with a 1M tip for the roses. You can make them as big or small as you’d like. Then start filling in the other areas with the smaller piping tips. The purple and the marbled pink and white tips are size 18 or 21 open star tips. As you can see, these’s a couple different ways you can use these tips. The darker teal color is a leaf piping tip in the 100 series. Size 103 is good for smaller cookies. The white color is a French star tip, size 199. I used this to make mini swirls or dollops of frosting. You can also see that I used this tip for the liners on the cupcakes. If it really easy to interchange your frosting colors and piping tips if you prepare your piping bags with couplers. Why do my cookies burn on the bottom or edges? Many factors could effect this including your internal oven temperature, types or cookie sheets or over baking. My cookies are thick, but I do not over bake them. Just as the edges start to turn golden, take them out of the oven and then let them cool on the tray. 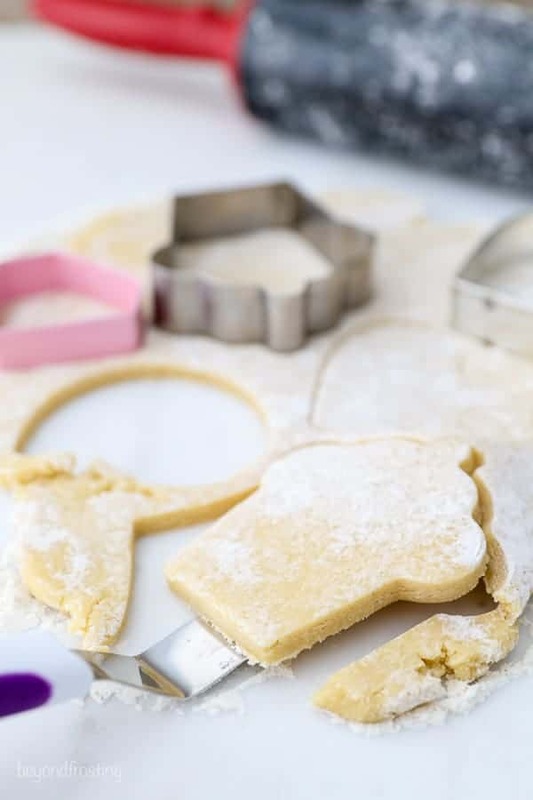 I recommend using a silicone baking mat, which adds a layer between the cookies and the cookie sheet and can help prevent your cookie from burning. Also, I recommend baking these on the middle rack of your oven to ensure they are evenly baked. I also only bake one tray at a time. How long do I need to chill the dough? Yes! Separate the dough into 3 smaller balls, double wrap in plastic wrap and then flatten to about 1-inch thick rounds. Keep frozen and thaw overnight in the refrigerator. Can I freeze the cookies after I bake them? Yes! 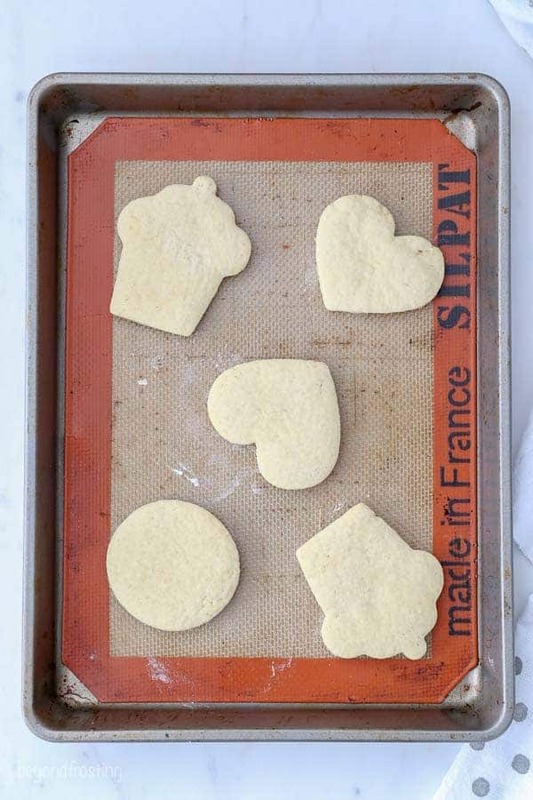 You can freeze the baked, unfrosted sugar cookies. Place them in an airtight, freezer-safe container or in a Ziploc bag. Thaw completely before frosting. How thick should I roll out the dough? I like a nice and thick cookie, so I recommend at least ¼ inch thick. It can help to evenly roll out the dough if you roll from the center and out towards the edges. You should also be sure to roll out your dough on a well-floured surface. 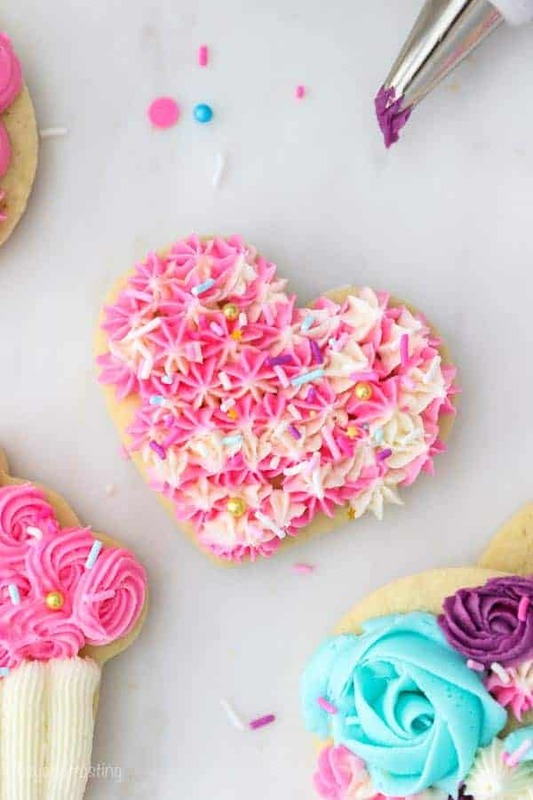 This easy sugar cookie recipe is a soft baked sugar cookie that is not overly sweet and it’s perfect with vanilla buttercream. Beat the butter and sugar on medium high speed until the sugar is dissolved and creamy. In a small glass dish, dissolve the baking soda in the milk. Add baking soda/milk, vanilla and egg to the butter. Beat until all ingredients are well incorporated. Slowly add the salt and the flour ½ cup at a time and mix until a stiff dough forms. Form 3 softball size balls of dough. Wrap tightly in plastic wrap then chill in the freezer for at least 15 minutes or in the refrigerator for at least 30 minutes or up to 2 days. Remove the dough from the fridge and sit at room temperature for 10 minutes. Roll the dough out on a well-floured surface about ¼” thick. 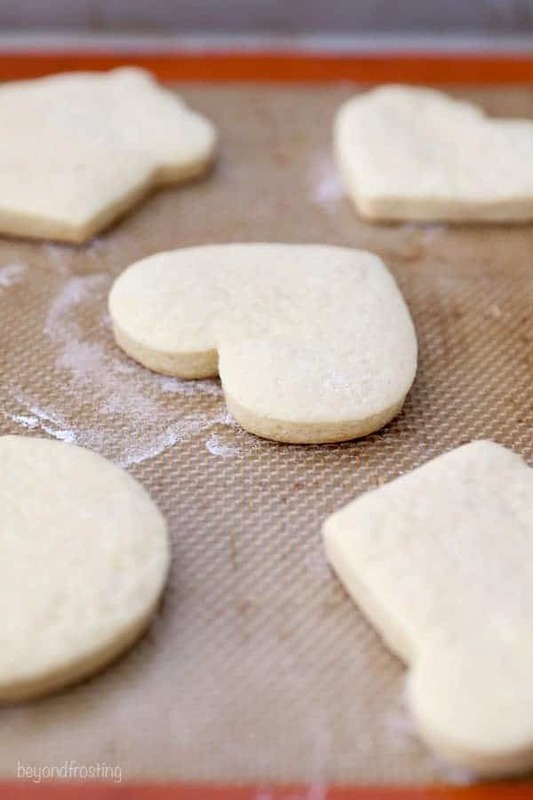 Use a cookie cutter to cut the shapes and transfer to a lined baking sheet. Use parchment paper or a baking mat to help prefer browning on the bottom of the cookie. Bake at 350° for 8-12 minutes. Allow to cool for 5 minutes before transferring to a wire rack to cool completely. Dough can be refrigerated for 2 days, otherwise I suggest freezing. Remove the dough from the freezer several hours before you intend to use.